For the last few days, I had been thinking about this software JMJ used on his Atari. The use he made of it was to generate random piano notes on Waiting For Cousteau track. This software used an algorythm, I don't remember its name, and I don't remember the name of the software either, do you have any ideas of the exact name ? Ha yes? Do they have a special name ? The Atari ST, had two important MIDI Sequencing softwares: Cubase and Logic. If none of both are, I really don't know! well. I've used google I found 5 or 6 programs for that kinda stuff i dont remember what was the name but there were lots of parameters to tweak. later program generated midi file. The second one seems to be interesting, thx for the link !! Well you Liked it before so why would the way it was conceived make you like it any less??? Its a bit like saying you Liked a Painting but then found out the artist got someone else to colour the picture in? he used a computer generated program to create Random Notes,its still a unique composition,and dare say that if he used it again it wouldn't create the same exact series of notes,that to me makes it all the more enjoyable as a composition,I listen to this track everyday. One of the most exciting moods of this track is the Build up to a concert,it was almost as if he tailored this track for that Purpose.Pure Genius,computer generated or not. Perhaps that was an early version of "Partner In Crime"? It was C-LAB NOTATOR that Jarre used on Waiting for Cousteau. Because there was in 1990 a whole Jarre special about WFC and the La Defense concert in "ATARI MAGAZINE - juillet/aoÃ»t 1990" (french magazine) where it was already explained. It was never a secret that Jarre used a computer to generate the random notes with a computerprogram on WFC. According to COTM issue 5, it was AMI, a fractal generator, running on an Atari Mega-ST.
Jarre programmed 16 starting notes in it. He apparently got the idea from the book 'Dirk Gentlys Holistic Detective Agency' by Douglas Adams. That is maybe possible, my source came from Atari magazine. OTH, I'm not so convinced what COTM says. Actually, I don't think that there was a sound generator based on fractral technology on ST with the name AMI. I still believe (and the most plaussible) that it was C-Lab Notator(because in notator you can random notes and Jarre used this program on every track on tha album WFC). I was a member of the E.L.I.T.E. group (a well known atari hackers in the 80'ies and 90'ies group) Never heard of AMI. It's funny though...nowadays people are more interested in "how" an artistic work is done insted of finding out what kinds of feelings the artist wants to mediate. You may see this everywhere; music, books, paintings, movies, photographs. Somebody uploading a stunning photo on the web and the first comments goes: what kind of camera/lens/brand/light settings/exifs et.c. et.c. was in use and allmost forgets the picture itself. You can have exactly the same equipment and methods but the result won't turn out "exactly" the same, because...the original thought has allready been made. Fist time I heard WFC I actually thought that JMJ picked the random notes by hand on a piano but now it doesn't matter. It allready is what it is. transmit to the listeners and it turned out pretty mediative and mystical. Still he choosed to record the track with exactly those sounds wich you can hear in the album. Thats enough for me to love the Waiting For Costeau. (ps. I could even have adored T&T but that sound was simply not my cup of tea...cheers. I don't think that there was a sound generator based on fractral technology on ST with the name AMI. [..] Never heard of AMI. AMI stands for: Algorithmic Musical Instrument, and was build by Cadenza Software. But Candenza made another app called ACT (Algorithmic Compositional Tool). "It generates random musical output, based on user-defined notes, which can be controlled in real time using a GEM interface or a MIDI source. Though rather simple â€” ACT only works on one MIDI channel â€” there are some nice touches in the way the 'algorithm' can be tweaked. And being able to output a MIDI File of an iteration is always a bonus." Sounds like the same app ! Sorry to resurrect the thread, but I was curious if he used AMI to generate the piano notes, then what else was applied to get the rest of the background sounds and noises? It wasn't all done in AMI, was it? I'm just curious if it's possible to recreate something similar and what type of instruments or samples would be needed, and where could they be found? Thanks. Sheet music and midi file. Easier to experiment with it. I'm just curious if it's possible to recreate something similar and what type of instruments or samples would be needed, and where could they be found? Thanks. 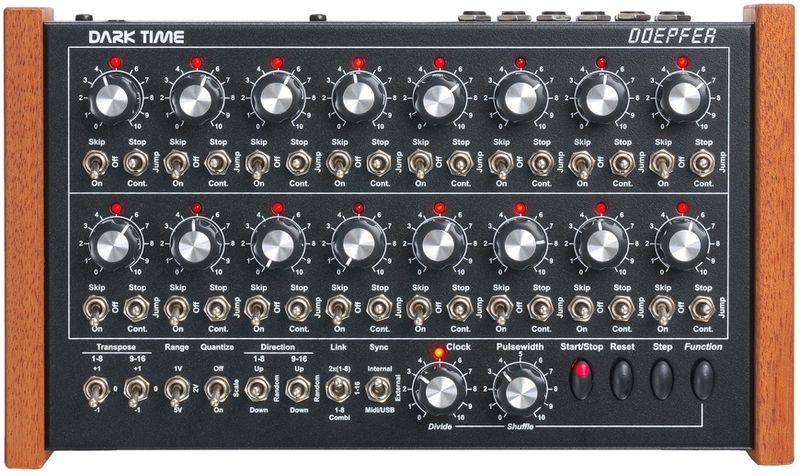 There's a nice hardware sequencer called the DOEPFER DARK TIME, it has a random mode.